Back in July, I reviewed Preserve's toothbrushes. I appreciated the company's philosophy and promised to be on the lookout for more products made by them. So, I was excited when they recently sent me a cutting board to try out. 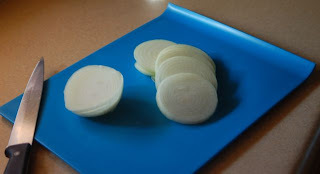 A cutting board made of 100% recycled plastics. Not 10%, but 100%. In January, Preserve rolled out a new set of kitchen products that are BPA-free, MADE IN THE USA and dishwasher-safe. All of their products are made from 100% recycled #5 plastic or 100% post-consumer recycled paper. Their new product line includes the cutting board I was able to try out (and is pictured over there), a colander, and a set of 3 mixing bowls. What amazes me is that the prices are completely reasonable! The large colander retails for $11.99, the set of 3 mixing bowls for $21.99, the small cutting board for $8.99 and the large cutting board for $12.99. I don't use recycled products because they are less expensive (because, let's face it, they rarely are), but because they're good for our environment. Too often, though, recycled items are priced out of my budget. The items from Preserve are extremely reasonable, and I have to say again that they are made in the USA. I wonder if more companies shouldn't take a look at their business model and figure out what they're doing right!? If you use any of their products and they wear out (like toothbrushes), you just send it back to them and they will recycle it into another new product. Read more about how the recycling efforts of companies and individuals helps power their company. Preserve's tagline is "Nothing wasted. Everything gained." They have a growing selection of products to choose from, and seem like a thoughtful, committed and responsible company. If you're in the market for kitchen goods, please check out their stuff and see how it'll work for you. I know you'll be pleased! Super Bowl Giveaway! Big Prize!